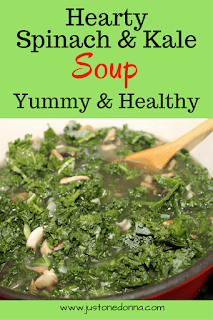 This month I'm focusing on healthy foods and today's recipe for Spinach and Kale Soup fits perfectly. I don't like to throw food out. It just seems wasteful. So, when I looked in my refrigerator last weekend and saw some kale and spinach that were calling out to be used, I decided to make a soup. Have I told you I love soup? This post contains affiliate links for your convenience. I am compensated when you shop using these links. Winter can be challenging when shopping the produce department for fresh vegetables. Spinach and kale always seem to be in abundant supply in winter and look fresh and appetizing. This is compared to the other vegetables I prefer like green beans, zucchini, and asparagus. This soup is kicked up with a flavorful gremolata. Are you wondering what gremolata is? Gremolata is a condiment typically made with chopped parsley, lemon zest, and garlic. For this recipe, the parsley is replaced with chopped spinach. You'll definitely want to make the gremolata. 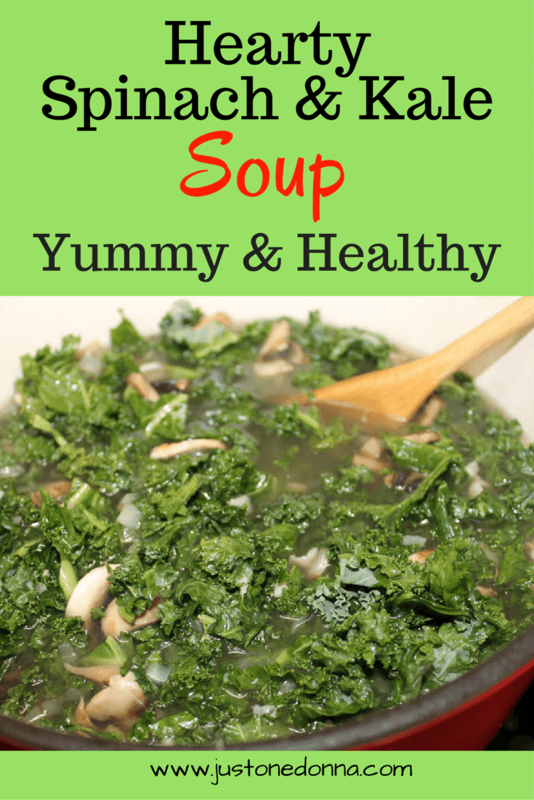 This flavorful concoction adds a special little punch to the soup's flavor. You won't want to leave it out. Lemon is essential, as well. Both the zest and juice of the lemon are in the gremolata and the juice is added to the soup. A fine gauge grater , or Microplane, is a simple kitchen tool you'll want to use to make this soup. It is the only tool that makes it possible to quickly grate the zest of a lemon. Oh, while you are grating the lemon zest be sure to breathe in deeply. The scent of the lemon will brighten your day. This grater also makes it possible to finely grate a clove of garlic for the gremolata in about three seconds. If you don't have a grater please add it to your list of kitchen things to buy. You can pick one of these handy dandy graters up online or at any kitchen store. Your chicken broth influences the amount of salt and pepper you will need to use. Use the amounts listed in the recipe as a guide. If your chicken broth includes salt as an ingredient you may need to use less salt than is in the recipe. You can use whatever kind of potato you have on hand. I used Russet potatoes, but Yukon Gold or red potatoes would work as well. You could use other greens to make this soup. Collard greens, Swiss chard, or escarole could be substituted. Keep bacon frozen in your freezer in packages of three or four strips and you'll easily be able to chop bacon for added flavor to soups. Toast the pine nuts in a dry frying pan over medium heat until lightly browned. As soon as you smell a nutty aroma you'll want to remove the pan from the heat. Heat one tablespoon of olive oil in a heavy pot over medium heat. Add the chopped bacon and cook until the fat is rendered. Add the chopped onion, garlic and mushrooms. Season with 1 1/2 teaspoons of salt and 1/2 teaspoon of pepper. Cook until the onions are tender and translucent, about 5 minutes. Add the chicken broth, potatoes, kale and two cups of water to the pot. Bring to a boil and then reduce to simmer. Cook for 5 minutes. Add the spinach and lemon juice. Taste for seasoning, adding salt and pepper as needed. I added another 1/2 teaspoon of salt and 1/4 teaspoon of pepper. Cook for 5-10 minutes more. Serve hot, topped with the gremolata and toasted pine nuts. Mix one cup of the chopped spinach with the lemon zest, lemon juice, olive oil, salt and pepper in a small bowl. Toss to combine and set aside. I used to cook alot with organic kale and spinach but after finding out it is not recommended for postmenstrual woman because of the huge iron hit, I stopped completely using either one. I've moved on to organic turnip greens and other greens for color and nutrients. Even my vitamins for over 50+ doesn't have iron. Just a note of caution to some of you ladies out there. Keep up the good work on your Blog, Donna. It's a true winner for sure! Hi, Nonni. Yes, that's a good reminder for all of us to be more aware of the food we eat and how it might affect our nutritional needs. Thanks for supporting Just One Donna, Nonni!